Sunset Green Home: Site Work is Underway! Site work for the Sunset Green Home project is underway. So what is site work anyway? I met Tom Freund, the owner of TKF Excavating and Demolition, at the site on Friday. Tom explained that this initial phase of site work for Sunset Green Home includes scraping and protecting topsoil for later reuse (a LEED for Homes prerequisite), driving piles that will support the new house, excavating for retaining wall footings, setting septic system components in place, importing clean "fill" to regrade the property and enclose the septic system, constructing retaining walls, and installing piping from the municipal water meter to the home. 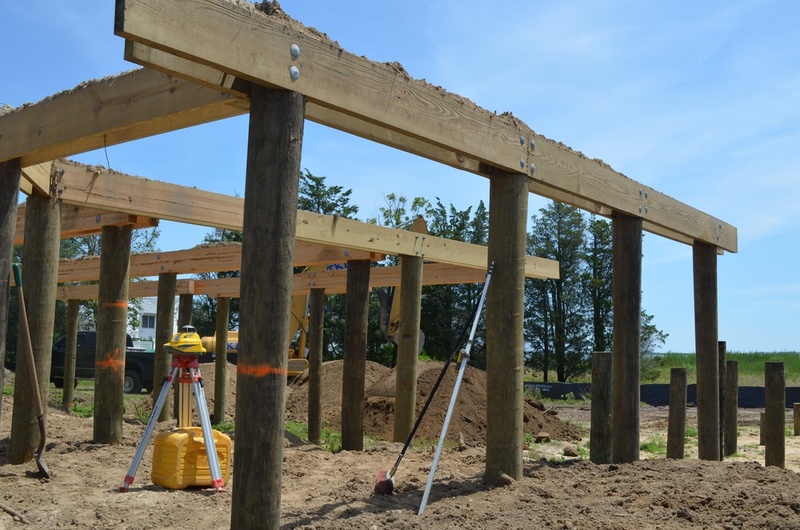 Our site work began with Stout Construction driving over 100 pilings that will support the house, decks, stairs and other structures that make up the site. 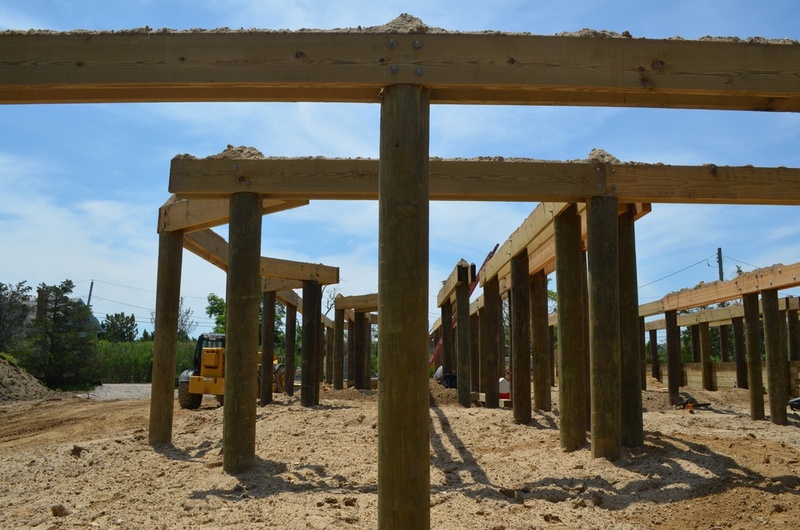 Bob Brandt, one of Stout's principals, sourced the 10 - 12" diameter pilings from a forest in Maryland, which helps us earn 1/2 point toward our LEED certification for using materials that were grown and harvested within 500 miles of the project site. To ensure the piles would be driven straight, Bob used a Vibratory Hammer attached to a crane. The hammer vibrates a piling, causing the soil beneath it to liquify, and allowing the piling to slip into the ground. Once the piles were in place, Stout's crew tied them together with power beams as cross-bracing. The house will be built on top of this structure. As an aside, another contractor who was on site with me commented on how straight the piles had been driven, by contrast to other projects he has seen. Thanks to Bob and his crew for starting the project off right! Using the site plan that was approved by the Town of Southampton, our builder, Chris Mensch (Coastal Management LLC), marked the piles at the level where fill will be deposited to regrade the site. While I was at the site, TKF Excavating and Demolition delivered a number of truckloads of clean fill, which was spread under and around the house in the areas where our grade is scheduled to be elevated. 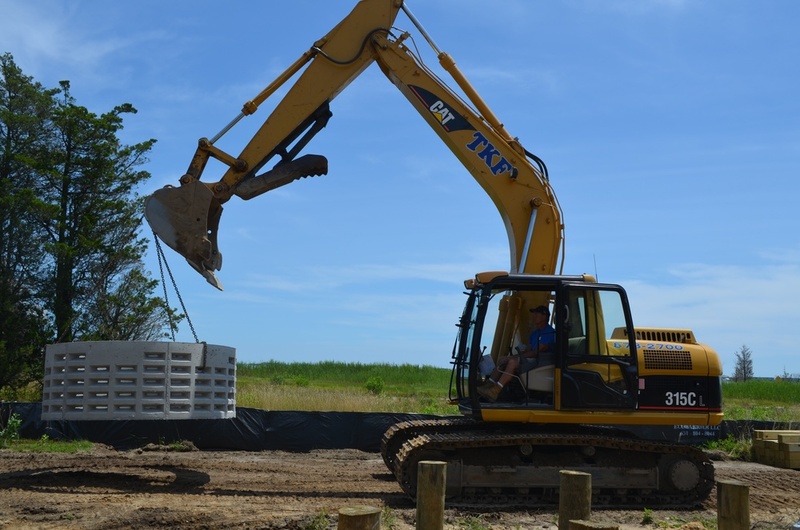 Tom and his crew were busy moving septic system components into place when I left the site. I'll provide another update when the site work is finished. Meanwhile, framing begins this week, so there will be lots to report over the coming weeks. Newer PostSunset Green Home Progress Update: Sanitary System is Installed and Inspected! Older PostInduction Cooking: Functional AND Energy-Efficient. What's not to Love?